Homemade Snickers Bites. Before I started eating healthy, Snickers bars were one of my weaknesses. Once I became vegan, I could no longer eat them. So I created these homemade vegan snickers bites to help fill the void. This recipe is super easy and only contains 5 ingredients and very little added sugar. If you like my German Chocolate Bites, you will love these homemade vegan snickers bites as well. I could also see these going really well as an ice cream topping. Yum!! This recipe is vegan, gluten free and paleo. You can probably make it nut free buy using sunflower seeds in place of the nuts. In a small bowl , mix the ingredients for the chocolate coating. Line a standard sized muffin pan. Pour a small amount of the chocolate mixture into each lined muffin cup. Place the cups in the freezer while you make the filling. Drain the dates. In a food processor , blend up the dates into a caramel-like consistency. Then add the nuts and pulse a couple times to mix them up well. Spoon a little of the date and nut mixture into each muffin cup carefully. Cover the date mixture up with more chocolate mixture and place in the freezer to firm up. This will yield 6 large snickers cups. Please store these in the freezer. They should last up to 6 months. Enjoy! Snickers for breakfast before I changed my diet to incorporate as much organic as possible, no processed foods and eliminating fast foods unless it was from a restaurant like Chipotle. Thank you so much for this recipe. Your recipes make it possible to eat healthily and with indulgences and pleasure. Do you mean use cupcake liners, in the muffin pan? 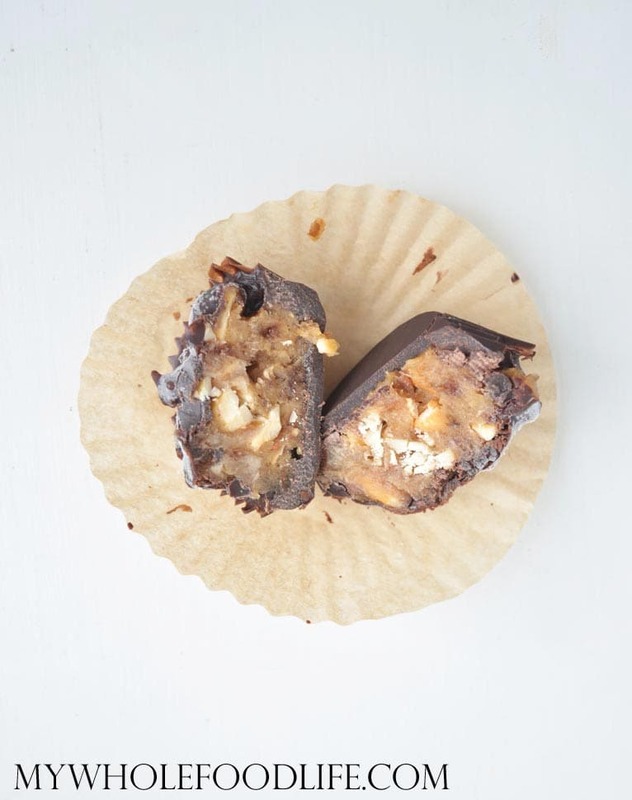 I'm SOOO excited to try this recipe because it is my dad's favorite candy bar and I keep disappointing and wasting ingredients with the new healthy recipes I try, so I want to make it up by finally making a delicious and nutritious recipe! Thanks for posting it! Yum! I used to make a treat like this years ago, but with melted chocolate chips for the coating. These days I usually do the coconut oil chocolate, I need to give these a go! I left my dates soaking in almond milk in the fridge for a few days... do you think they're still ok? I hope so! Can't wait to try these! As long as they smell okay, they should be good. Thank you for this delicious treat. Not quite the caramel taste, but thoroughly enjoyed by all. Now, I am on a quest for Reese's peanut butter cup replacement. I wonder if it would work to soak a few dates and then add PB. Just made these and loved them. I can't believe they would last in anyone's freezer for six months! Not only yummy to eat, but easy to make. Thanks for all the great recipes you create. This is probably a dumb question, but would it work if I used cocoa powder instead of cacao powder? I just don't have cacao powder on hand but should probably look into getting some :). Hi! So I kept this recipe and kept looking at it longingly but truth be told dates have always frightened me to some degree. I don't think,"Oh yum! I get to cook with dates!" But I decided to be brave and went to the bin section of our Whole Foods store and bit the bullet and bought the dates. I can't say enough about this recipe and how much I love it. I have been gluten and dairy free for almost 8 years so I've pretty much convinced myself these are "real' snickers bars ha! I made them bite size in a mini muffin pan so I could pop them in my mouth throughout the week as a treat for surviving my kids and home schooling ha! Every time someone stops by I grab one and give it to them and then tell them they are made with dates and every.single.person. has loved them! Yay for hidden treats for mom in the freezer ha! Yay!!! Dates used to scare me too. I would avoid recipes that called for them. Then just like you, I gave a recipe a go and I was hooked. They really are very versatile. I tried using my vitamix blender to blend the dates, which was a bit of a disaster and didn't really work properly. I had to add a bit of coconut cream to make the blades move a little. I also found it difficult to make these look at all pretty, but with that said they are still delicious and I'll try making them again once I get a real food processor! I absolutely loathe dates. Anything else I can use instead?? Dried figs?? Worth a shot. Just made these today in the mini-muffin tin. They were so good! I also ordered your new book. Your recipes are wonderful! Thank you for all your work! Thank you so much Sue! I am glad you liked them!